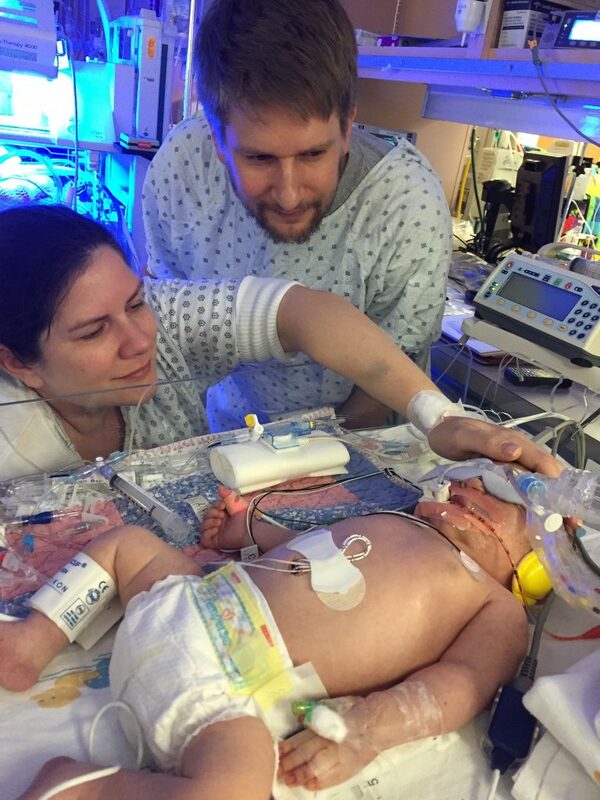 In the February edition of our Preemie Family newsletter we learned about NICU Baby Silvana Quinn Smith who was born at 8 lb. 1 oz. and spent 49 days in the NICU before coming home. Read more in an update by her mother and founder of Silvie Bells, Jennifer Smith. Our daughter Silvana Quinn (Silvie) was born with the umbilical cord wrapped around her neck combined with not hours, but days, of meconium in her lungs (meconium aspiration). Her lungs appeared to be filled with tar. This combination lead to severe PPHN – Persistant Pulmonary Hypertension of the Newborn; a life-threatening illness. Silvie was taken away from us at birth and rushed to our hospital’s NICU – Neonatal Intensive Care Unit. We did not see her for eight hours, when we were permitted to see her we were told that our hospital’s Level 2 NICU did not have the means to care for her and she was being transported out of our hospital to a Level 3 NICU a city away. It was a parent’s worst nightmare. I made a promise to Silvie and the Gods that if she survived I would give back in some way. I did not how or when, but I knew there would be a way to pay it forward. 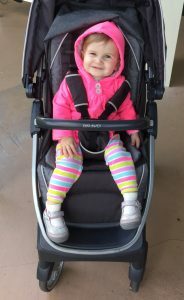 It was nearly two months that we stayed in the NICU before Silvana was discharged. The staff was amazing, the nurses were her second mothers and the doctors were miracle workers. In September of 2016, I saw that it was NICU Awareness Month and I remembered my promise to give back. I thought about the holidays being just around the corner and I remembered how horrible it was having our Silvie in the NICU throughout December and January, when we had imagined her home by the Christmas Tree during my pregnancy. That is when it hit me, my “give back” would be to parents with babies in the NICU during the holidays. I would give the parents in our NICU the things that helped us along our journey. 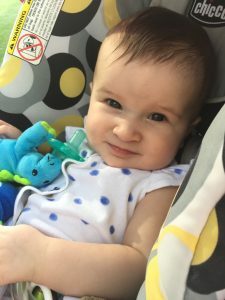 Owlet home pulse-oxygen monitor: allowed us to continue to monitor her blood oxygen and pulse as we made the tough transition from NICU life to her first days at home. Boppy Pillow – the pillow that goes around your waist so that you can hold your baby comfortably for several hours, it also makes for a good pillow for parents to take a nap in the chair next to their baby. Wubbanub – the pacifier with a little stuffed animal on it, make is so much easier for baby to hold. It taught our daughter to bring her arms in “midline” after being splayed-out for so long. Lulla Doll – helps babies sleep at night, as it softly “breathes”, they are amazing for babies, they mimic the sounds of a mother’s womb. Reusable water bottles -pumping and breastfeeding mom’s MUST stay hydrated to produce milk. Starbucks gift cards – the hospital has a location on the ground floor, if it wasn’t for caffeine we never would have been able to stay up with her as long as we did. Subway gift cards – the hospital as a Subway on the ground floor where we ate most of our meals. WaterWipes – the only chemical free baby wipe out there and then only one that stopped our diaper rash. Notebook and Pen – It’s impossible to remember the countless drugs, doses, feed schedules, doctors and nurses names, daily accomplishments and losses; a notebook was key to keeping track of our baby’s first months. Snacks – it’s hard to remember to eat while you’re sitting next to your baby’s crib for 12 hours. Kind Bars really got us through! I started a little GoFundMe campaign, I posted on social media and before long my fundraiser took off. A month later I realized that my project was growing and I knew I needed a name, that is when Silvie Bells was born. “Silvie Bells, Ringing In Holiday Cheer To NICU Families”. Over the course of three months I raised nearly $10,000 online from friends and family and I received another $20,000 in product donations. I was able to attain everything on our list for all 50 families in our NICU. On December 18th, 2016, I held a small event at Salah Foundation Children’s Hospital and gave away our 50 Silvie Bells gift bags to mothers and fathers with babies in the NICU. We shared tears, stories, hugs and a lot of love. My heart changed forever. I knew that Silvie Bells was my calling and that I wanted to make Silvie Bells an annual event and a national event. With your help I hope to bring Silvie Bells to 100 NICUs across the country in 2017. My goal is 500 NICUs in 2018, and by 2020, I hope to be the “Toys for Tots” of the NICU world.